MSc in computer science and PhD in medical imaging from NTNU university (Trondheim, Norway). Working as global SW architect for the Ultrasound business in GE Healthcare (Oslo, Norway). Have completed a PhD on algorithms for real-time tracking of deformable models in volumetric data, using sequential state estimation. The primary application was automatic left ventricular segmentation in 3D echocardiography. The PhD included development of the world's fastest algorithm for 3D segmentation and tracking with deformable models. The developed tracking framework operated 10-100 times faster than known comparable systems, with typical execution times of 5 ms per model per 3D frame on typical computer hardware as of 2008. Endocardial LV segmentation with a Doo-Sabin surface. Endocardial and epicardial LV segmentation with two coupled Doo-Sabin surfaces. Tracking of LV endo+epi and RV in cardiac CT.
F. Orderud: Real-time segmentation of 3D echocardiograms using a state estimation approach with deformable models, NTNU 2010 (PDF, presentation). Opponents: professor Alison Noble, Oxford University; assistant professor Johan G. Bosch, Erasmus MC Rotterdam. F. Orderud, H. Torp, S.I. Rabben: Automatic Alignment of Standard Views in 3D Echocardiograms Using Real-time Tracking, in proceedings of the SPIE Medical Imaging conference - SPIE MedImg 2009 (DOI, PDF). F. Orderud, G. Kiss, S. Langeland, E. Remme, H. Torp, S.I. Rabben: Combining Edge Detection With Speckle-Tracking for Cardiac Strain Assessment in 3D echocardiography, in proceedings of the IEEE Ultrasonics symposium - IUS 2008 (DOI, PDF). F. Orderud, G. Kiss, H. Torp: Automatic coupled segmentation of endo- and epicardial borders in 3D echocardiography, in proceedings of the IEEE Ultrasonics symposium - IUS 2008 (DOI, PDF). F. Orderud, G. Kiss, S. Langeland, E. Remme, H. Torp, S.I. Rabben: Real-time Left Ventricular Speckle-Tracking in 3D Echocardiography With Deformable Subdivision Surfaces, in proceedings of the MICCAI workshop on Analysis of Medical Images - f-MICCAI 2008, p. 41-48 (PDF, presentation). F. Orderud, S.I. Rabben: Real-time 3D Segmentation of the Left Ventricle Using Deformable Subdivision Surfaces, in proceedings in the IEEE Computer Society Conference on Computer Vision and Pattern Recognition - CVPR 2008, p. 1-8 (DOI, PDF, poster). F. Orderud, J. Hansegård, S.I. Rabben: Real-time Tracking of the Left Ventricle in 3D Echocardiography Using a State Estimation Approach, in proceedings of the 10th International Conference on Medical Image Computing and Computer Assisted Intervention - MICCAI 2007, p. 858-865 (DOI, PDF, poster). J. Hansegård, F. Orderud, S.I. 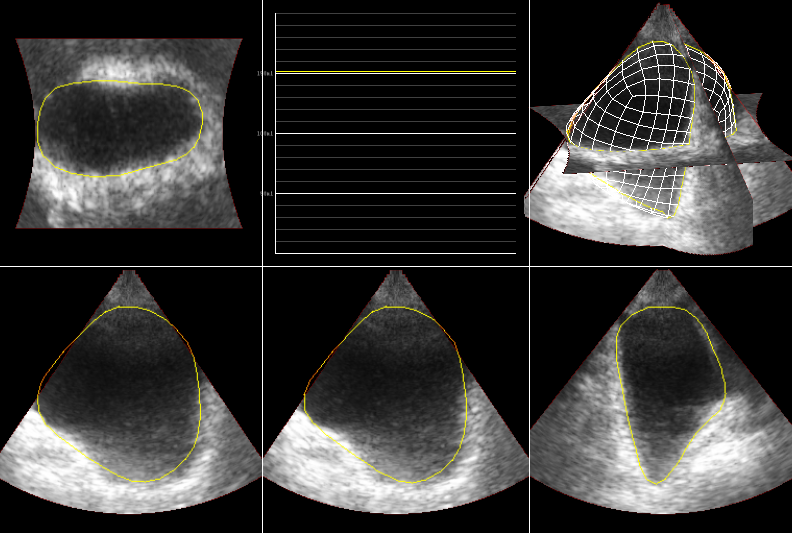 Rabben: Real-Time Active Shape Models for Segmentation of 3D Cardiac Ultrasound, in proceedings of the 12th International Conference on Computer Analysis of Images and Patterns - CAIP 2007, p. 157-164 (DOI, PDF, presentation, movie clip). F. Orderud: A Framework for Real-Time Left Ventricular Tracking in 3D+T Echocardiography, Using Nonlinear Deformable Contours and Kalman Filter Based Tracking, in proceedings of IEEE Computers in Cardiology - CinC 2006, p. 125-128 (DOI, PDF, presentation. F. Orderud, J. Hansegård, B. Amundsen, H. Torp, S.I. Rabben: Real-time Left Ventricular Volume Measurements in 3D Echocardiograms, presented abstract on EuroEcho 2007 (PDF). L. Løvstakken and F. Orderud, and H. Torp: Real-time Indication of Acoustic Window for Phased-array Transducers in Ultrasound Imaging, in proceedings of IEEE Ultrasonics symposium - IUS 2007, p. 1549-1552 (DOI, PDF, poster). F. Orderud: Comparison of Kalman Filter Estimation Approaches for State Space Models with Nonlinear Measurements, in proceedings of Scandinavian Conference on Simulation and Modeling - SIMS 2005 (PDF, code). Complete publication search (co-author of 48 publications with 244 citations as of December 2014). Sten Roar Snare: Quantitative Cardiac Analysis Algorithms for Pocket-sized Ultrasound Devices, NTNU 2011 (PDF). 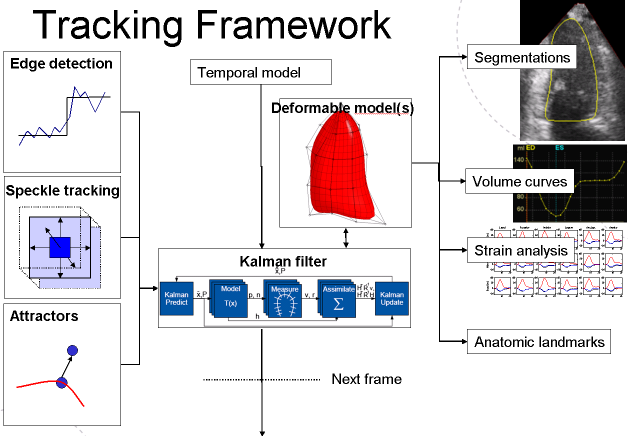 Engin Dikici:Ultrasound Cardiac Modeling, Segmentation and Tracking, NTNU 2013 (PDF). Jørn Bersvendsen:Segmentation of cardiac structures in 3-dimensional echocardiography, UiO 2016 (announcement). Presentation of PhD projects (presentation). F. Orderud: Method for real-time tracking of cardiac structures in 3d echocardiography, USPTO patent US7889912. H. Torp, F. Orderud, L. Løvstakken: Method and system for determining contact along a surface of an ultrasound probe, USPTO patent US8002704. F. Orderud, J. Hansegård, S.I. Rabben: Methods for using deformable models for tracking structures in volumetric data, USPTO application 2009/0238404. F. Orderud, S. Rabben, H. Torp, V. Lundberg Method and apparatus for automatically identifying image views in a 3d dataset, USPTO patent US8265363. A. Heimdal, S. Langeland, F. Orderud: System and method for displaying ultrasound motion tracking information, USPTO application 2010/0249591. F. Orderud: Method for Calculating The Sphericity of a Structure, USPTO application 2011/0276314. S.R. Snare, O. Gerard, F. Orderud, S.I. Rabben, B.O. Haugen, H. Torp: Ultrasound system and method for calculating quality-of-fit, USPTO application 2012/0065510. F. Orderud: Method and apparatus for providing motion-compensated images, USPTO application 2012/0155727. J. Hansegård, F. Orderud, A. Ziegler: Method and system for displaying intersection information on a volumetric ultrasound image, USPTO application 2012/0245465. S. Rabben, F. Orderud, O. Gerard: Method and apparatus for motion-compensated ultrasound imaging, USPTO patent US8657750 B2. F. Orderud: Depth coloring of ultrasound intersection slices from associated volume rendering, USPTO application US 20130150719 A1. F. Orderud: System and method for 3d imaging, USPTO application US 20130321389 A1. Boost - extensive C++ library. Qt - cross-platform UI framework. PyWin32 - Python for Windows Extensions. HDF5 - container format for numerical data. Jenkins - continuous integration server. NuGet - Visual Studio package manager system. Maven NAR - native plugin to the Maven build system. OpenSceneGraph - 3D visualization library. Invited speaker at the 30th year anniversary seminar for the ultrasound research group in Trondheim 2007, program (in norwegian). Prime minister Stoltenberg's favourite: Presentation of real-time heart volume measurements at Technoport 2007, TV-adressa (in norwegian). Slik har hjertet ditt det i dag, Adresseavisen 19. oktober 2007 (in norwegian). Invited speaker to the high tech session on 3D and model based image analysis on EuroEcho 2008. Forskning på automatisk segmentering of volummåling av venstre hjertekammer i 3d ultralyd, i rekrutteringsbrosjyre for sivilingeniør datateknikk 2008-2009 (in norwegian). Invited speaker to the Ultrasound 2025 anniversary seminar in Trondheim 2013, program (in norwegian). Invited speaker to the USART training course in Leuven 2013, program. List over some useful computer programs and libraries that I use.